Extreme Enginerding: Homeopathy: Worse than "Just Water"
Homeopathy: Worse than "Just Water"
In 1796, German physician Samuel Hahnemann first proposed the idea of homeopathy. Based on the concept that "like cures like", homeopathic remedies attempt to cure symptoms suffered by patients by using highly diluted concentrations of a substance that would normally cause the same symptoms. However, these remedies are ineffective, wasteful, and can be damaging if they stop people from seeking real medical attention. At first glance, the principle behind homeopathy may not seem that far-fetched. For instance, some vaccines are basically just preparations made from a non-life-threatening version of a disease in order to prepare your body to fight off that disease, and vaccines are great. Homeopathy takes this concept – fighting an effect with its own cause - way too far though, well past the point of ridicule. An actual example from the Canadian Society of Homeopaths is the use of onion juice as a remedy for hay fever. Onions cause runny noses and itchy eyes, and hay fever causes runny noses and itchy eyes. Homeopathy claims that since both of these cause the same symptoms, onion juice can also cure the symptoms of hay fever. Let me reiterate: homeopathy claims that using more of something that causes your problems will end up curing your problems. They literally claim that two wrongs make a right. Similarly, they claim that oysters can cure indigestion, arsenic stops diarrhea, and mercury can cure chronic pain. If homeopathy doesn't already seem ridiculous, it's about to. It's quite obviously not a good idea to ingest arsenic and mercury, and homeopathic remedies certainly wouldn't sell if they immediately killed the people who bought them. This is where the second major claim of homeopathy comes into play: the more a remedy is diluted, the more potent its healing powers will be. While having the obvious advantage of avoiding killing people by directly poisoning them, the dilutions used in most homeopathic remedies don't help the plausibility of homeopathy as a practice. Homeopathic remedies are commonly prepared by performing a series of dilutions by a factor of 100, where the number of dilutions is referred to as the C number of the remedy. For example, they could take one millilitre of an ingredient, add it to 99 millilitres of water and shake it, then take one millilitre of that and add it to a new 99 millilitres of water, and get a 2C solution. The original number of dilutions proposed by Hahnemann was 30C - a series of thirty 1% dilutions. This is an equivalent ratio of one part active ingredient in 1,000,000,000,000,000,000,000,000,000,000,000,000,000,000,000,000,000,000,000,000 (1 novemdicillion) parts water. For reference, a 6C homeopathic solution of salt water is supposed to help with irritability, but that's 40 billion times less concentrated than the salt in the ocean. The amount of liquid that's passed through an average 80 year old by the time they die dissolved in the combined water of all the world's lakes, oceans, and rivers is around 8C. What's intriguing is that if you started with a solution containing on mole of original material, at a dilution of 12C there's only a 60% chance of finding a single molecule of the active ingredient, and at a dilution of 13C, you're looking at pure water. A common over-the-counter homeopathic remedy at 30C isn't just essentially water - it is water. The most popular homeopathic remedy sold is Ocsilloccinum, a 200C dilution of duck liver that is supposed to help with the flu. There are approximately 1080 atoms in the universe, so in order to have enough water to get one molecule of duck liver extract in a solution at this dilution, one would need 10320 universes worth of water. Somehow this is still considered a very potent concentration. Oscillococcinum is labelled as consisting of 0.85 g sucrose and 0.15 g lactose – these are 100% sugar pills. Homeopathic practitioners can't easily argue with math, and most will readily admit that there is no active ingredient present in the remedies that they sell to patients. Instead, they claim that water has a "memory" and that the dilution and shaking process involved in preparing a homeopathic solution leaves an imprint on the water, thus changing its properties. There is absolutely no evidence for this. Logically, it also doesn't hold up. As has been pointed out by countless comedians and scientists, it doesn't make any sense that water could remember the tiny amounts of poison once dissolved in it, but forget all the sewage it's come in contact with. Both the ability for water to retain an imprint of a chemical, and its ability to selectively forget other chemicals, would violate basic fundamental laws of physics. So homeopathy is based on a principle that doesn't make sense, at concentrations that are nonexistent. Yet it is still around. In the United Kingdom, the Royal Homeopathic Hospital has the Queen as their official patron, and homeopathic remedies like Oscillococcinum in France are one of the most common treatments for the flu. Why? One leading theory is that any perceived benefits of homeopathic water are likely due to a mix of confirmation bias and the placebo effect. Studies have shown that just the act of going to a clean hospital-like environment, listening to a compassionate doctor (or someone perceived to be a doctor), and taking something that you believe to be a medicine can often help with certain conditions. Placebos can have a measurable effect on improving health in certain circumstances, and are well-enough studied that we know a fake needle is more effective than a fake capsule, which is in turn more effective than a fake pill. Confirmation bias likely also plays an important role in people's opinions on homeopathy. As an example, homeopaths describe a process known as 'homeopathic aggravation' - a temporary worsening of symptoms following a dose of a homeopathic remedy. When a patient takes the dose and then starts to feel worse, the homeopath can claim that's all part of the plan, reassuring the patient and convincing them that the remedy is working. Of course, an alternative explanation for homeopathic aggravation is self-evident - a patient notices they have a runny nose, takes some non-medicine, and then the rest of the flu hits and they claim that's the 'aggravation'. Well, no - that's just how diseases work when they aren't subject to actual medicine. After hearing these arguments, a homeopath may ask to agree to disagree and claim that since the remedies are so dilute they can't possibly have side effects, but they bring comfort and maybe benefits to the people who buy them, surely there’s no harm in offering it as an alternative medicine. The harm comes when people spend money on homeopathic remedies, mistaking them for real medicine, instead of going to real doctors. The placebo effect can have noticeable effects on health, but isn't generally capable of curing cancer. Patients with serious medical conditions who forego proven treatments from real doctors put themselves at severe risks they otherwise wouldn't need to experience, much like those who choose to avoid vaccines or sunscreen. 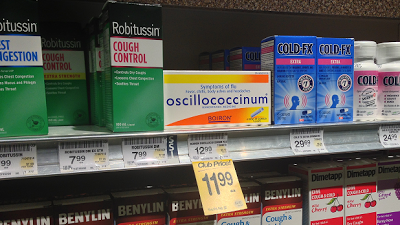 Homeopathy sold alongside real medicine, courtesy of your local Safeway. Homeopathic remedies do not need to pass the same testing requirements as real medicine to be sold in Canada, but they can still be sold deceivingly on a shelf in a grocery store beside real medicine as though they are equally valid options. Someone desperate for symptom relief who doesn't know any better could easily mistakenly be buying sugar pills and pure water, costing them money and delaying real treatment. This is where the real harm of homeopathy comes from. Drug regulations require strict testing for a reason, and if homeopathy cannot provide evidence that it works or at least a plausible working mechanism then it should not be portrayed and sold commercially as an equally viable form of treatment. At the Superstore they're with the organic foods and natural remedies (where they belong), at the opposite end of the store from the pharmacy. Great article. This is very useful. Thanks for sharing.